Welcome to the Alexandria Dukes Rugby Football Club! The Dukes compete in the NSW Suburban Rugby Union Division 5 competition. Located in the south of the Sydney CBD, we provide playing opportunities for men of all ages and skill levels. We aim to display a competitive, hard-hitting performance on the field and a social, welcoming culture off the field. Everyone’s welcome at the Dukes. Add us on Facebook or Instagram to check out what we’re up to. The Dukes play every Saturday home game, as well as train every Wednesday from 6:30pm, at Booralee Park, Botany. After games and training (as well as any other opportunity), you’ll find us at our sponsor, the Captain Cook Hotel, Botany. Seeking new players for 2019. To register to be part of the Dukes Rugby squad, simply download the Fusesport Rugby app on your Android or iPhone device and follow the link to register. If you would like to be invoiced or discuss other payment options, please contact our Treasurer, Phil Hughes, at treasurer@dukesrugby.com.au. Want to play rugby in 2019? 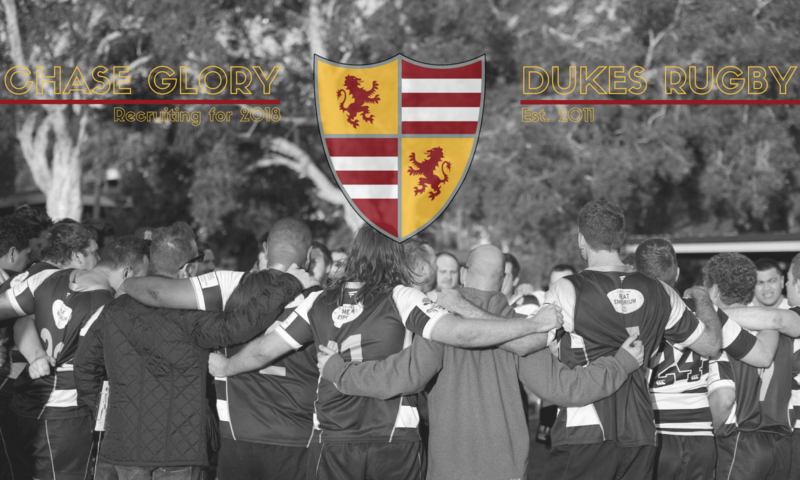 Email play@dukesrugby.com.au or click here to send us a Facebook message for more info.